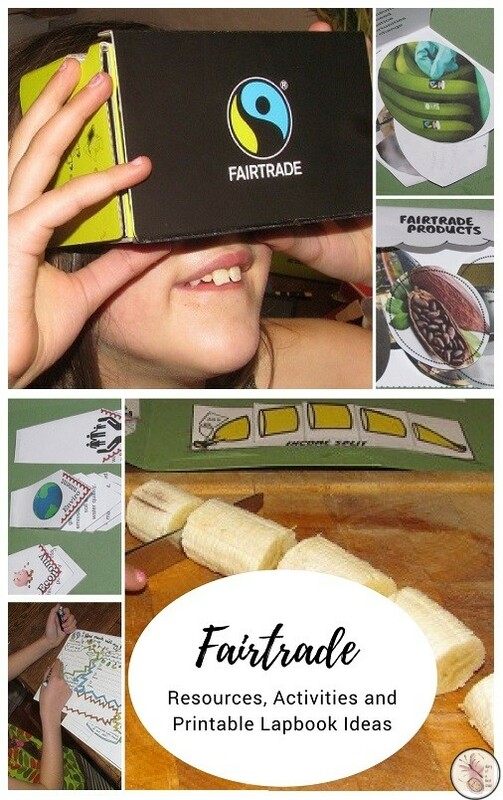 We are halfway through Fairtrade Fortnight in the UK – with World Fairtrade Day being in May – and the kids and I have been talking about Fairtrade and what it’s purpose and value is. 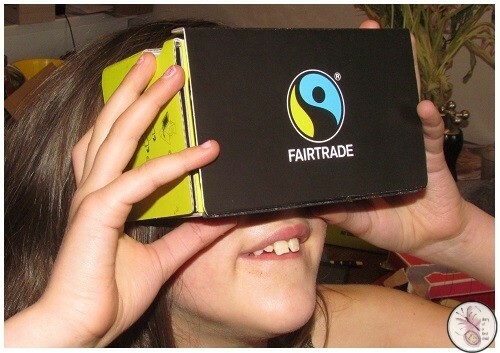 There’s a wealth of information around Fairtrade online, so I’ve worked through it and pulled out the bits that my children would respond well to. 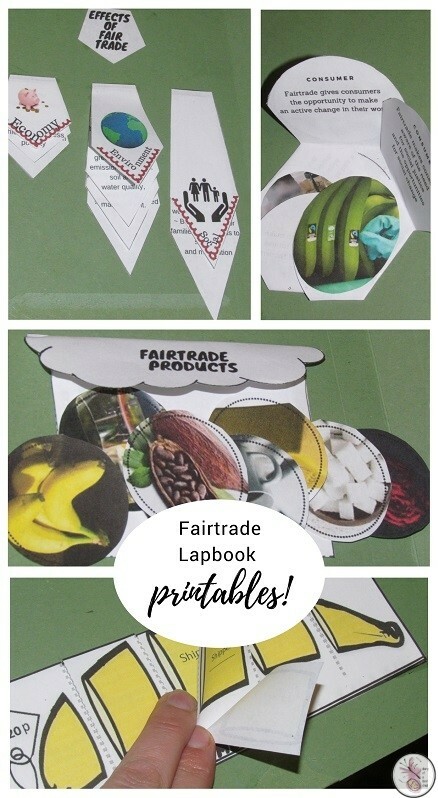 I also wanted to do a little lapbook for a Fairtrade study unit because Ameli responded so well to our Mexico lapbook, but I couldn’t find anything suitable ready made – so I made one. It took me all weekend, and it’s not very big or complicated! But I’m happy with it. The virtual reality headsets are the only paid resource we went for – it’s £5 and we’ll be able to put it away and use it again. They are headsets that you use to watch a Fairtrade video shot in 360 degrees – providing a fully immersive experience via your smart phone. You don’t need them, but they add a pretty neat dimension to this topic. You can then use them to watch a story like Samuel’s Fairtrade Story. The same website also has display posters, stickers and the Coobana Game which are all free, so if you’re buying the headset, add some of those to your order. CAFOD – The Catholic Agency For Overseas Development – has some fabulous resources for primary school kids. 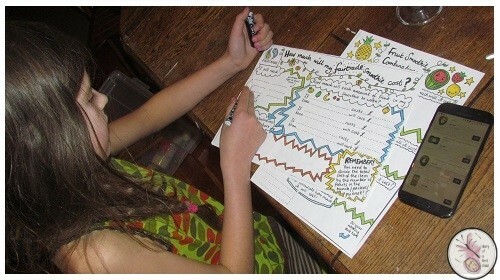 I’ve adapted the Banana Split activity in the lapbook from their Banana Split Game. This page includes the story of tea, and a Fairtrade cotton presentation if you want to branch out from just bananas. There’s also a Fairtrade quiz all ready-made. TES – the Times Education Supplement – has resources added by teachers who use them in classrooms. I particularly like this little maths activity where you get the child to make a smoothie, breaking down the cost of individual portions (using fractions) and then work out your recipe and it’s cost. The School Run has a collection of interesting facts regarding Fairtrade. They can be nice facts to drop in as you talk about Fairtrade. They could make a nice DIY quiz too. Traidcraft Schools has a great list of Fairtrade resources by ages and key stages and includes links to curriculum and learning objectives and all that. You can pretty much create your whole plan from this site, in some ways! You can also download a Fairtrade around the world map. Also try these games and activities for keeping learning interactive. There’s a really good ‘about your chocolate’ Powerpoint that you can use from the Equal Exchange website, and if you want to spend a bit of money you can order real cacao pods. You can download the lapbook activities here. These underpin pretty much anything you’ll read above and just put it all ‘in one place’ so to speak. 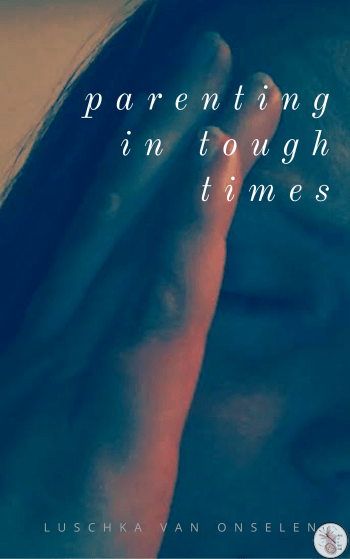 If you download this resource you will be added to our mailing list, where you will be updated when we have new study units. You can unsubscribe at any time if you’re no longer interested. 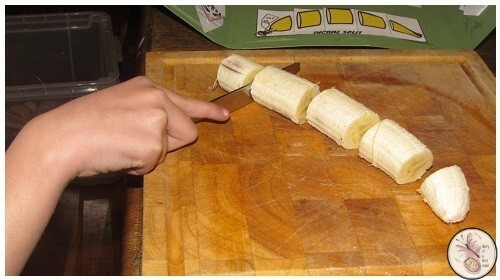 and finally, a wheel that follows the journey of a banana from field to table.